At Superheroes Central we take our heroes very seriously, and when it comes to great superheroes they don’t come any more serious than Superman, and with that in mind we have picked some of the best authentic and realistic Superman costumes for men. The man of steel is possibly the most famous and recognizable superhero ever, a fan favourite even to the uninitiated, with fantastical powers such as super hearing, super speed, super strength, invulnerability, and the power to fly just to name a few of his super cool abilities. Nothing can stop this guy. Unless you have some Kryptonite or your name is Doomsday. But other than that, nothing can stop this guy. 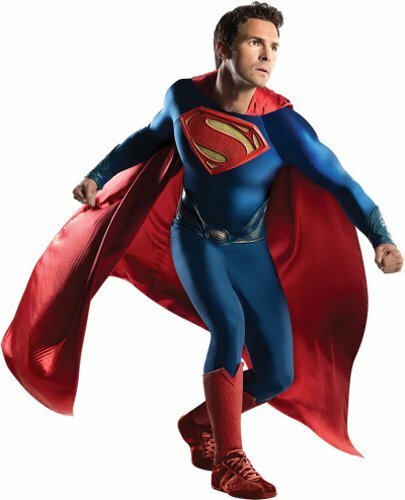 So if you are going to a party, convention or festivities, why not go as the man of steel, we’ve had a look around and selected some of the best and authentic costumes which have received really positive reviews, so have a look and hopefully we’ve found what you need. So we have found some of the best Superman costume ideas for the adults out there. In almost eight decades Superman’s costume hadn’t changed at all, but in his last two outings on the big screen Man Of Steel, and Batman Vs Superman when he was played by Henry Cavill, his costume got it’s biggest change yet, gone were the red briefs over the blue tights, and instead he just had his blue costume minus the red briefs, shortly thereafter the comics followed suit. So guys whether you are a fan of the original costume or his new revamped outfit we have found some of the best Superman costumes because we picked costumes that those who have bought it have shared some really positive experiences. 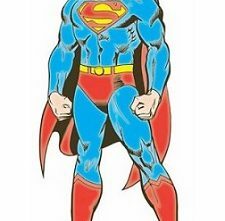 If you want to impress your friends ant the party with some fancy facts about the man of steel go to Superman’s history and origin page. 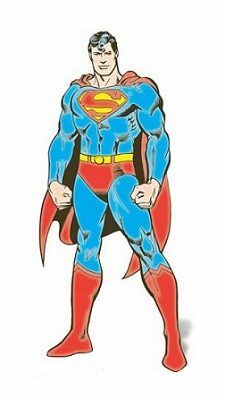 When we do these review pages for adult superhero costumes we always try to include at least one costume for the serious fan and the serious cosplayer and this is the best Superman costume for sale you can get. If you want to look like a Superman who stepped right out the pages of a comic book than this is the absolute best cost costume there is. Designed to transform virtually any man into a superhero it’s made from latex and it is comprised of form molded muscular body parts that when assembled truly transform you from an ordinary man into a man of steel with a truly heroic physique, it also comes with a high quality cape, belt,boot tops and an awesome vinyl wig that will give you those classic Kryptonian curls. Be warned though this costume doesn’t come cheap and is for those adult Superman fans who really want to reach amazing heights. Just the best Superman costume for adults out there. And so with great joy we’ve added this authentic retro Superman second skin costume , which means it’s form clinging, so if you are going to wear this one it might help to be in decent shape(but you don’t have to be ridiculously buff, Christopher Reeves certainly wasn’t) If like some of us here at Superheroes Central and you are a man in your 40’s or older than chances are when you fell in love with Superman on the big screen it was the late great Christopher Reeves playing the alien Krptonian in all his glory, as a not quite buff superhero in his blue jumpsuit and red underwear on the outside in proud comic book styling(or so it seemed). It’s just the look that most of us adults associate with Superman and we make no apologies, the costume features great original colours and has a cool belt and quality boot tops. 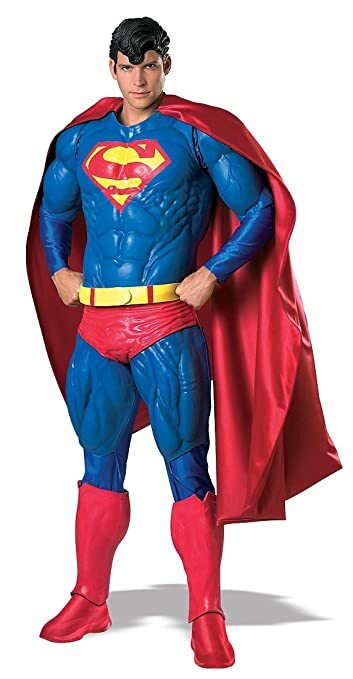 This is the best costume for men who remember a different Superman to the one we have now and just want to have fun with their friends for it’s sure to be a crowd favourite. 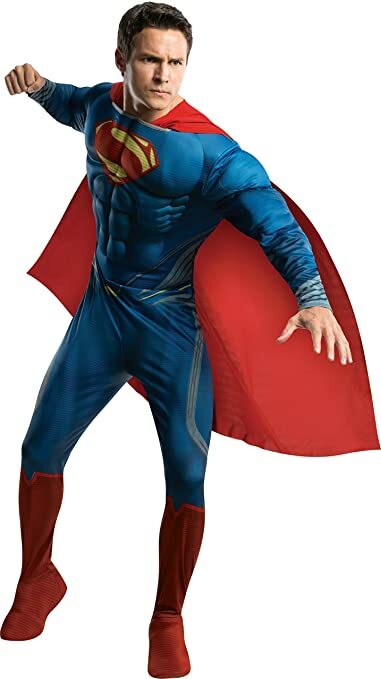 We’ve found this realistic Superman replica costume because the man of steel is enjoying a new audience at the moment with Henry Cavill’s portrayal of the iconic superhero on the big screen in DC’s attempt to get it’s own super franchise of superhero movies off the ground. Although the movies haven’t been doing aswell as their Marvel counterparts, there do have a loyal legion of fans willing them on to success. So if like us you are really enjoying the man of steel’s latest movie incarnation and want to be him at your next party or convention this costume is modelled on his appearance from the Man of Steel movie, the jumpsuit itself is made from a blend of polyester and spandex with a large ankle length satin cape, it also has a foam molded belt and symbol on the chest. A great costume that people for the most part seem very happy with, some comments in the customers reviews were that the jumpsuit isn’t as clingy as normal spandex(which for men who aren’t in great shape is probably helpful) overall people thought it was of good quality and very realistic. So if you want a look closer to the new movies this is the best Superman replica costume for you. This real looking Superman costume is the best one for those of us not in such great shape. So we all know that Superman is known as the man of steel right? But why do people call him that? Sure he’s virtually invulnerable, right. But he’s also really, really buff. Especially since Henry Cavill took over the role, that guy is a beast. Unfortunately not all of us men are blessed with a physique that will look great under a super tight set of super tights. Fortunately the guys who design these great costumes know this and in this case they’ve got us covered, an awesome and cheap Superman costume for sale modelled on his appearance in the movie Man Of Steel, which not only is real looking but includes some fake muscles for us men who need the extra help to pull off that classic superhero look. Made from 100% polyester, this costume has been purchased by many and has received hundreds of reviews and they are overwhelmingly positive with two minor negative themes running through them, they are that when ordering this costume the sizes do run a little on the big side so it may be worth ordering a smaller size than you would normally(just something to consider) and also that most people found the boot covers to be small generally, and when ordering the costume you should bear that in mind and if that is going to bother you, perhaps have a back up plan, like buying some Superman boots separately. Definitely the best Superman costume for the slightly out of shape. A very similar costume to the one above, made from polyester and again the designers were nice enough to give us men those much needed extra foam muscles, there are a few minor differences, firstly this Superman costume is modelled on his appearance in the Dawn Of Justice movie, also the cape is slightly shorter and broader across the shoulder area and there is no little gold trim around the midriff giving the illusion of a belt. While there were not as many reviews as the previous costume, it did receive more overwhelmingly positive reviews and so was a worthy addition to this list, as we are trying to give our customers a great range of tried and tested products to choose from. Just one of the best Dawn of Justice Superman costumes for men. 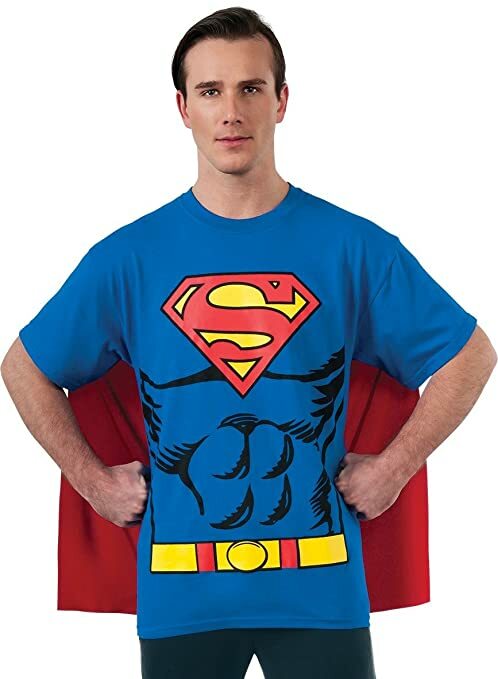 Again We’ve included this Superman T-Shirt and short cape costume on the list because it’s a really simple and easy costume, and the best for those adults who want to look the part of Superman without all the hassle . A great outfit for warm weather or outdoors activities as the cape is really short and won’t get in the way. The T-Shirt is made from cotton and the cape is polyester, literally hundreds of people reviewed this costume and they love it with only a few negative reviews. It comes in lots of sizes for men. So if you want to be a part of it all, no fuss than this is this superman t shirt and cape costume is for you. We at Superheroes central understand that sometimes men just want to have a good time with your friends and be a part of the fun, but you don’t want to get to carried away and just need something really simple. 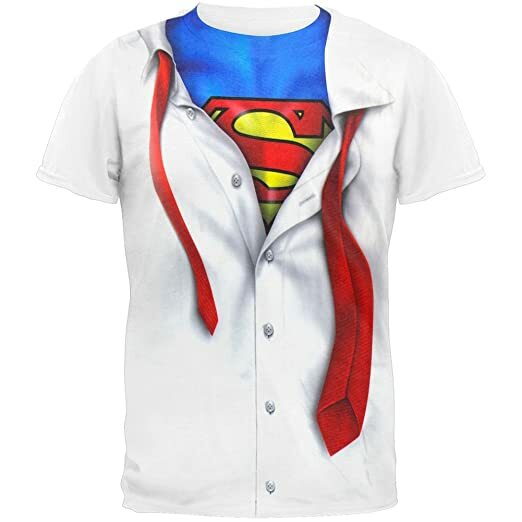 And simple costume ideas don’t come any simpler than this, this Clark Kent is Superman costume, is a great cotton T-Shirt print that implies that under your work shirt that you are Superman, not Clark Kent. It comes in a few sizes for men. Sure to get a few chuckles from your friends. From those who bought it most of them loved it. This costume is best suited to those men who want the fun without all the fuss. Superman has been around for nearly 80 years and has actually been in the movies nearly that long, first appearing on the big screen in the 1940’s, and it is only in the last 10 years that there have been any changes to his iconic costume, we thought you’d appreciate a stroll through time and remember some the great actors that played this legendary superhero. He’s a great clip showcasing the best authentic and realistic Superman costumes. Superman has been around for nearly 80 years, and is a superhero worthy of admiration, for his values are synonymous with the American values, truth and justice, along with the Flash, Wonder Woman, Batman, Aquaman, Green Lantern and the Martian Manhunter, he founded the Justice League of America.